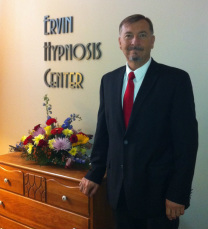 Founded in 2007, Ervin Hypnosis Center has assisted numerous people in enhancing their lives. Richard Ervin, the owner and lead hypnotist says, "People of all ages and walks of life come to us to work on a variety of issues such as stopping smoking, losing weight, relieving stress and tension, relieving irrational fears, and a number of different performance issues." He continues with, "Referrals come from physicians, counselors, and other providers. Most importantly, our happy clients are our best referral source." Our mission at Ervin Hypnosis Center is to provide the highest quality of individualized, compassionate, and effective hypnosis by using the latest techniques and methods available. Our mission includes educating the public whenever possible about the field of hypnosis and its variety of uses. The Ervin Hypnosis Center is dedicated to helping our clients succeed in reaching their goals through the use of hypnosis. Our mission at Ervin Hypnosis Center is dedicated to helping people succeed in reaching their maximum potential through the use of hypnosis. We believe hypnosis is an excellent tool for making and maintaining positive changes in a person's life. Each person is a unique individual and deserves a session tailored to their specific needs. We offer both individual and group sessions and a devoted, professional staff to inspire and motivate our clients in adopting positive changes. Hypnosis is all about YOU! What keeps your eyes open and staring at the ceiling? What issue or problem are you dealing with? What stops you from being successful? Hypnosis, also referred to as hypnotherapy or hypnotic suggestion, is a trance-like state in which you have heightened focus and concentration. Hypnosis is usually done with the help of a therapist using verbal repetition and mental images. When you’re under hypnosis, you usually feel calm and relaxed, and are more open to suggestions. Hypnosis can be used to help you gain control over undesired behaviors or to help you cope better with anxiety or pain. It’s important to know that although you’re more open to suggestion during hypnosis, you don’t lose control over your behavior. Richard Ervin discusses the many uses of hypnosis with James Renford Powell. Richard also performs an actual demonstration with one of the audience participants. We are proud to announce, 80% of our clients are from referrals!